One month into the conflict, intense violence continues with dire humanitarian consequences. Not only are people directly dealing with the impact of violence and insecurity, some are struggling to reach hospitals so are dying of treatable conditions. Hospitals are in desperate need of medical supplies and shortages of fuel may force some to close. “Last week a four year old child came into the hospital with Tonsillitis. He had not seen a doctor or had any medical care for two weeks. The infection had become so severe that he died. With access to medicine this death could have been prevented.” Dr Thomas Lavin has been working in Khamer in the Amran governorate for the last 6 months. The UN reports that at least 1,080 people have been killed, over 4,350 injured and estimates that 150,000 have been displaced in the month to April 25. Yemen’s Human Rights Minister, Ezzedine al-Asbahi, said on 27th April that around nine million Yemenis are in pressing need for humanitarian aid. MSF’s teams have treated more than 1,250 war wounded people, including those injured during airstrikes, since March 19 (775 Aden, 101 Haradh, 40 Amran, 350 Ad-Dhale). · In Aden fighting, attacks on ambulances, snipers and road blocks make it difficult for patients to reach MSF’s hospital. The number of wounded coming to our hospital in the city has dropped, despite the intensity of fighting. · Access into Yemen is restricted and safe movement for humanitarian aid within the country is very difficult – despite the huge needs. MSF has sent around 100 tonnes of medical supplies so far and been able to send in staff by sea and air, but much more is needed. 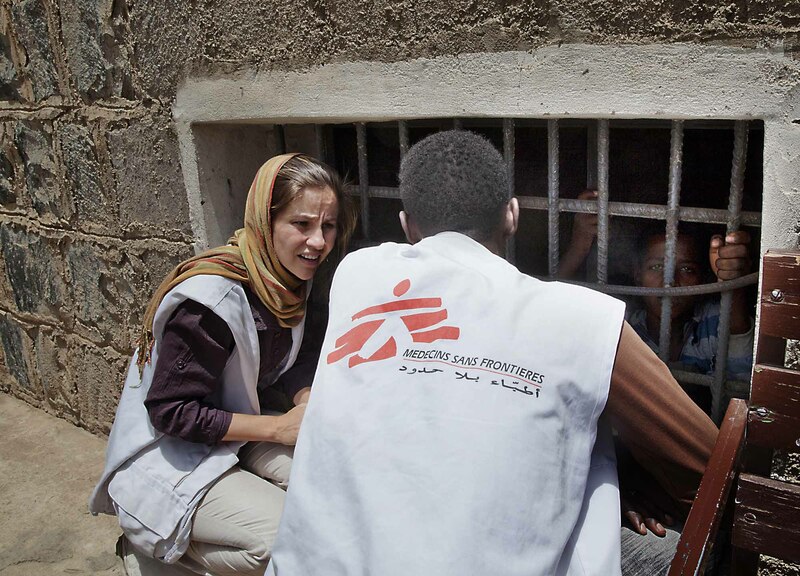 Where MSF is working: Total of 565 staff working in the country: 31 international staff and 534 Yemeni staff. More details about our current operations: Aden – Clashes continue in the southern city of Aden where MSF runs an emergency surgical unit. There are continued street battles as well as shelling from the ground, air and sea in some areas. There have been electricity, water and fuel shortages in the city and communications networks are often down. Since March 19th MSF has received more than 775 injured at the hospital. However, since the beginning of April, the number of patients has decreased to around 10 per day, despite the clashes continuing and increasing in some areas, pointing to difficulties in access to the hospital. 7 Ministry of Health (MoH) ambulances have gone missing. 2 Yemeni Red Crescent volunteers were killed on Friday 3rd April while in an ambulance. Our staff still find it difficult going to and from the hospital, and some staff now live at the hospital. The MSF hospital in Aden has been hit by a number of stray bullets, with some windows broken. On April 16 an airstrike less than 500 meters from the hospital led to a number of broken windows and shrapnel was found in the hospital courtyard. On 20th April, an ambulance trying to refer two patients from a clinic in Lahj to our hospital in Aden was stopped at a checkpoint and turned back; one patient later died. Sanaa – On April 20th a huge explosion in south-west Sana’a caused 574 injuries and 39 deaths, according to the Ministry of Health. The injured were received by at least 10 hospitals in Sana’a, three of which were supported by MSF with donations of dressing kits, drugs and medical supplies. We also provided psychological support for victims and donated 1,000 litres of fuel to ease serious shortages which mean some hospitals can no longer operate. Ad-Dhale – Since March 19th MSF’s Qataba and Al Nasser hospitals have received 350 war wounded patients. Referrals between the hospitals for specialised treatment, including the MSF hospital in Aden, remain extremely difficult. Amran – The MSF hospital has received around 40 injured in the town of Khamer, due to airstrikes in Amran governorate. This included 30 injured who were treated on 15th April after an airstrike on the town of Huth. The injured included women and children. The team is also concerned about people in remote areas of Amran governorate being unable to access the hospital in Khamer due to difficulty of transport and shortage of fuel. We are seeing less patients from Al-Asha and Al-Qafla districts and are particularly concerned for women from these areas with complicated pregnancies. Drinking water is also lacking due to shortages of fuel for water pumps. There has been no electricity in Khamer for two weeks. In the town of Huth, where MSF supports the health center, staff and patients are scared to go to the health center, for fear of bombing. Haradh Town in Hajjah governorate, north of Yemen – On March 30th, 34 wounded people were brought to the MSF-supported hospital in Haradh after the attack on Al-Mazraq IDP Camp. Between April 21st and April 24th airstrikes and shelling in Haradh district caused a further 11 deaths and 67 wounded who were treated by MSF medical staff in Haradh public hospital. The latest attack took place on the night of April 24th, when several shells hit Haradh town. Large pieces of shrapnel landed less than 30 metres from Haradh public hospital, as medical staff received the first wounded. Nine injured arrived at the hospital; two of them died. The attacks have provoked a mass movement of people with most of Haradh town’s remaining inhabitants abandoning their homes. The majority of staff and patients at the hospital have also fled.